Ok, I'm back. Got locked out for a bit due to an email change. There's been some updates. I started putting a changelog on the github page. New tools, texture, shape, rotation, and some other small stuff. How's overall performance and any chance for advanced lighting on that? Performance seems pretty decent considering the csqc side hasn't been optimized as far as draw order. FPS on my old machine stays around 200 at the current settings. I've set it up to draw/load more or less by tweaking the code, so there's room for experimentation. Much can be optimized on the server as well. I'm sure there's a faster way to do things than what I'm currently doing, but so far seems decent. The main issue I notice is the load/unload sequence causing a slight stutter, but I'm also running it off an old HD. The default load area is wider than it is tall, so the load/in is more noticeable when changing elevations. 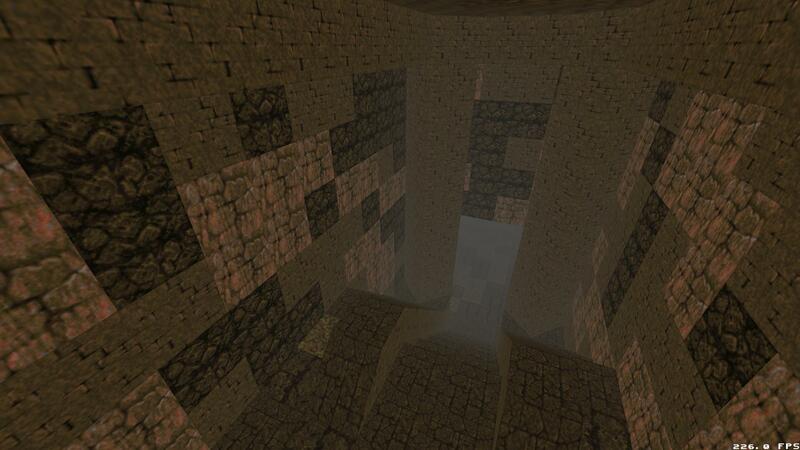 Someone who knows how to write shaders would need to help out on the project to get lighting into it. That is what it needs the most, but I'm having a hard time getting into learning shaders. Feel free to swap out textures. This project is just framework, no actual game within it. I will probably make a game with it later, but I'm mainly focusing on advancing the framework. I hope someone at Func_MsgBoard reads this and propose a quick map challenge using only cubes. Also I should note that the source is set up to just drop into Quake or any mod. You have to edit your main.qc and client.qc source files, but I've kept those edits very minimal. Look for server/sv_main.qc and server/sv_client.qc. CSQC integration is fairly easy as well, check client/cs_main.qc and client/cs_view.qc. They are not as well commented yet though.